By Susan Able. Photographs by Hannah Hudson. When Rano Singh welcomes you into Pansaari, her Indian spice store and grocery located on buzzy 17th Street's restaurant row, you know you have arrived someplace special. The walls are covered with tiles imported from her native India, lined with long shelves of the freshest spices. Behind an inlaid marble bar, amazingly fragrant chai tea, South Indian coffee and her own kombuchas are served, as well as Indian food. A committed locavore, Singh buys her lemongrass and mint from a local farm, and the honey is from a beekeeper in Washington, D.C.
Pansaari feels more like the living room of a friend with very comfortable Indian furniture. It’s a place to linger in conversation and soak in the smell of fresh spice. Singh explains that in India a “pansaari” is the spice grocery. The first consult for ailments is to the pansaari for spice-based remedies. Tonics, such as fennel water, are commonly used. 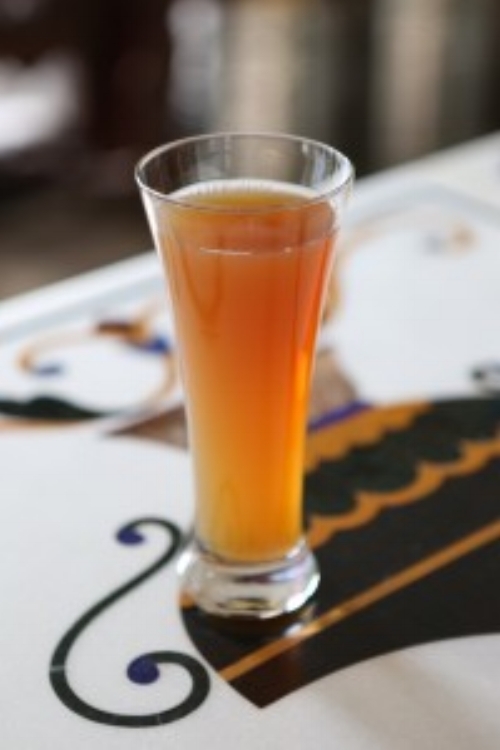 On a cold winter night, Singh offered up a glass of 100 Jor Bagh, a calming tonic with a recipe unique to her family in Jaipur, India. 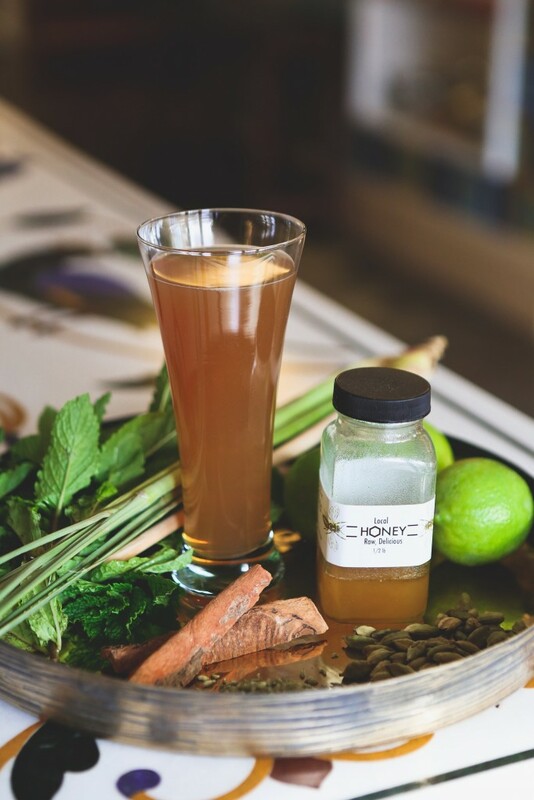 Based in Ayurvedic nutrition, Singh considers this a balancing drink for digestion—all the various ingredients, which are steeped into a tea, have healthy and unique medicinal properties. Recipe by Rano Singh. Makes 2 gallons. This calming tonic is as tasty as it is soothing. It is important to add the ingredients in the proper sequence to preserve the essential elements. It makes 2 gallons, which will last up to a month if refrigerated. Take a large pot, add the 2 gallons of spring water and bring it to just under a boil. Add the fennel seeds and chopped lemon grass. Bring to a full boil for 3 minutes and turn off the heat. Add the crushed cardamom and cinnamon and let it steep for an hour. Bring the pot to a boil again and add the mint bunches; cover the pot and turn off the heat. Let the mixture steep for 6–8 hours. Strain the solids out. To the liquid, add the honey and stir it well until it dissolves. Add the juice of 4-6 lemons, to your taste. Drink chilled from the refrigerator or slightly warmed as a tea, but no ice. It dilutes the mixture and is frowned upon in Ayurvedic tradition. Buckle up, roll down the windows and get ready for an amazing summer cocktail cruise. 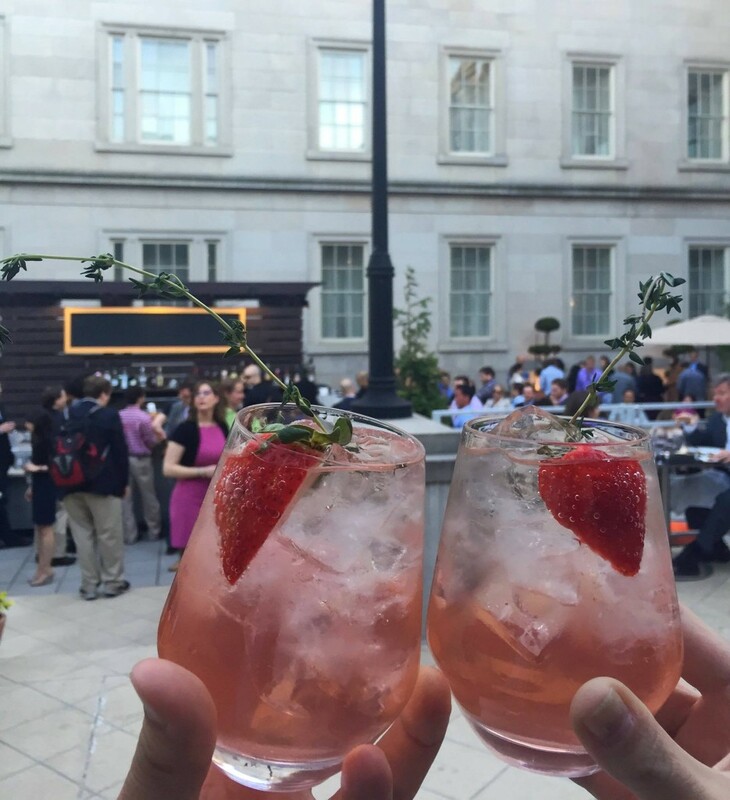 We are happy to share with our Edible DC readers the full lineup of amazing summer cocktail recipes and specialty drinks served at the Edible DC Cocktail Derby on May 9. 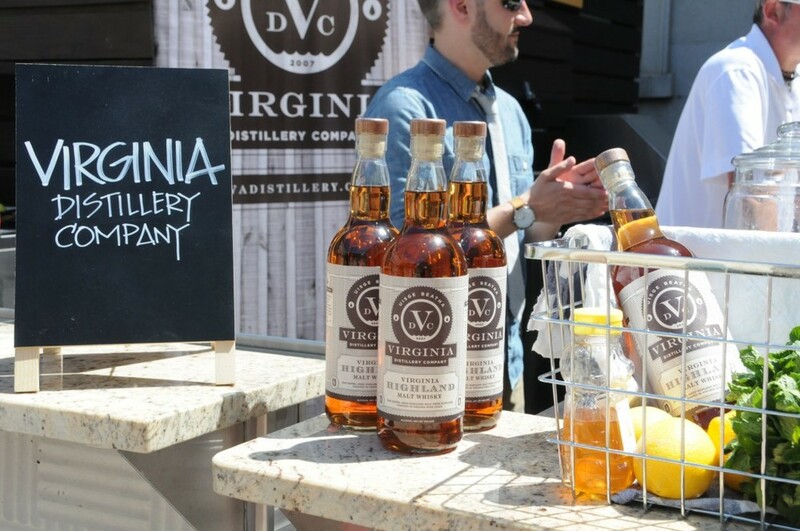 The event featured top shelf distillers of whiskey, bourbon, gin and new local craft distillers of a Virginia scotch-style whiskey. Beverage artisans True Tonics and Runningbyrd Tea were on hand to provide samples and mixers. Horse racing season inspired the decor and attire; hats and snappy outfits were everywhere. The event was catered by Poste Modern Brasserie and held in the outdoor courtyard of the Hotel Monaco. Vendors included Whistle Pig, James River Distillery, Koval, Catoctin Creek, Copper Fox, Virginia Distillery and Bernheim Wheat Whiskey. Special thanks to Kimpton Hotels and Restaurants, Typecase Industries, Amarillyis Floral + Event Design, and Elizabeth Duncan Events. Many thanks to event photographers Christina Brown and Katrina Tavanlar. Shake, strain on ice and top with sparkling water and lemon verbena for garnish. Pour first three ingredients over ice, top with club soda. Garnish with a half strawberry and sprig of fresh thyme. Combine all ingredients in an old-fashioned or rocks glass and stir. Garnish with an orange peel. Combine rum, grapefruit juice, and grenadine over shaved or small-cube ice in an old fashioned glass, top with club soda, and garnish with a sprig of mint. Muddle the lemon and mint in a cocktail shaker. Add ice and remaining ingredients and shake well; strain into a chilled old-fashioned glass filled with crushed ice. Garnish with mint leaves. Muddle limes in a cocktail shaker. Add pea purée, mint leaves, gin and ice to the shaker and shake well. Strain into a rocks glass filled with crushed ice. Garnish with mint. *Pea Purée: Take a cup of shelled peas, 1 oz of cold brew green tea, a teaspoon of sugar and a pinch of salt and place them in a food processor or blender until smooth. Strain the mixture using a fine mesh sieve. Shake all ingredients with ice and pour into a glass. Top with club soda and garnish with a wedge of lime (optional: also garnish with mint). Pour the whiskey into the tea and shake a few times. Pair with a cinnamon stick and mint and serve. In a cocktail shaker, gently muddle lemon with mint leaves, taking care to just barely bruise the mint leaves. Add honey syrup and Virginia Highland Malt Whisky and shake with ice. Strain into a rocks glass over one large ice cube. Garnish with two mint leaves slapped between your hands to release essential oils. Place all ingredients in a cocktail shaker with ice; shake well and strain into a martini glass. Add mint to a rock glass with crushed ice, and muddle the mint to the ice. Add the rye and shrub and stir to combine, then garnish with more mint. Thanks to Edible DC intern Avery Morrison for compiling the recipes and photos.